The nature walk: it’s lovely little experience. It offers fresh air, open spaces and, perhaps, some piece and quiet. However, every once in a while, it’s fun to shake things up a little — nothing crazy, mind you, but just something a little different. Suggestion: Calaveras County’s Upper Natural Bridge trail. Not your everyday hike, the relatively easy out-and-back Upper Natural Bridge trail (about thirty minutes per leg) leads you to the caverns of the Natural Bridges for a leisurely afternoon of walking, picnicking, a little splashing and swimming, and a hint of spelunking. The trail, seven miles south of Murphys, is well-traveled and is at a decline on your way to the natural bridges. The Coyote Creek babbles along, leading the way to the spectacular limestone caverns it created all those centuries ago, serving up plenty of gorgeous photo opportunities. 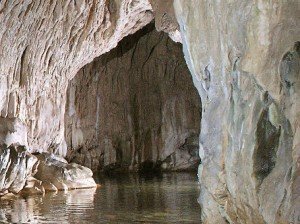 If you really want to enjoy the afternoon, bring along a picnic basket for a stream-side meal, and your bathing suits so you can more easily explore the caverns. …Just don’t tucker yourselves out too much, as the trail back out is at a bit of an incline. While you’re out there, you can swing by Angels Camp (just a few miles west) to continue the day’s fun by stopping in at the Gold Rush-era Angels Camp Museum, or even catch a movie in the towns cozy Angels Theater.